Everybody Hates Chris is a sitcom that I never really followed as it aired on television. Prior to this review I had only seen random episodes while channel surfing. Despite, I enjoyed watching season four on DVD. Set in the eighties about a young African American boy growing up in Brooklyn, Everybody Hates Chris is a fun-filled comedy with lively characters and enjoyable developments. At the same time, I did not think it is a show I would want to revisit time and time again. For this reason, this DVD release has been given a rent it recommendation. Season four marks the final twenty-two episodes of the show. It opens up with the episode "Everybody Hates Tattaglia". Chris starts tenth grade at Tattaglia High School. He is mixed with emotions as high school has bigger bullies, tougher class, and more mature girls. He is also thrilled at the prospect of no longer being the only black kid in class. To his dismay, his old teacher Ms. Morello, now a principal, put him in a special homeroom with all white kids. Chris has an interesting start. At the same time, Tonya makes daddy proud when she asks to get a job. Her new employment gives her mom a number of headaches. The episode is a fun way to start the season. It is goofy and sets a good tone for future episodes. As the season continues, Chris undergoes additional trials at school involving girls and dating, fitting in, driving, friends, sports, and getting by as the only black kid in class. "Everybody Hates Homecoming" is a fun episode with a more than usual goofiness to it. Ms. Morello pushes Chris to ask the newest transfer, Jenise, to homecoming. She is gorgeous and oddly says yes to Chris, but on the condition that her parents approve. When Chris meets the parents, he is given a dose of unreality--the family is a spoof of the Huxtable family from The Cosby Show. They approve of Chris, but of course, as homecoming approaches, everything goes wrong. The situation plays out in a hilarious manner. "Everybody Hates Varsity Jackets" is another really fun episode. Chris is determined to improve his coolness factor at school. To that end, he decides to get a varsity letter and joins the wrestling team. Luckily, he is the smallest and only one in his weight class. Chris wins a bunch of matches by default. Unfortunately, as his heads swells up, so does his belly. Chris' fight-free matches go the way of the dodo and after he gains a little weight. The end outcome is a fun reflection of how everything goes wrong for him. 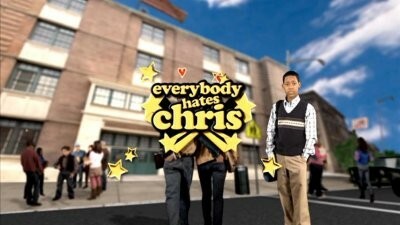 "Everybody Hates The Car" is another episode with a good situation turning bad for Chris. Having turned sixteen and acquired his license, Chris buys his uncle's car. He quickly finds out about car responsibilities from insurance to fuel to auto theft. It is another win/lose situation, which is full of laughs. 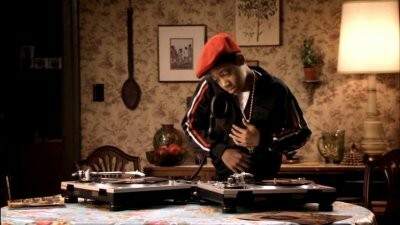 Overall, I enjoyed watching the fourth and final season of Everybody Hates Chris. While this review is my only experience with a full season, I can see way people like it. The sitcom is a lot like The Wonder Years, but racier. Chris Rock's narration works well for it. In the end, I enjoyed the season enough. Still, it was not one of my favorites and do not imagine wanting to buy the other season sets. On that note, fans will want to pick it up, but newcomers and casual viewers should rent it. 1. Everybody Hates Tattaglia: Chris starts high school and anticipates attending a school with some diversity, only to discover the new principal, Ms. Morello, has placed him in the only all-white classroom. Meanwhile, Tonya gets a job at a beauty salon, but customers don't take to her brutally honest comments about their looks. 2. Everybody Hates Cake: Chris agrees to help a classmate improve his grades and hopes he'll return the favor by helping Chris get the attention of his latest crush, Maria. Rochelle reluctantly befriends an ex-con who is back in the neighborhood and Mr. Omar goes out of town and leaves Tonya and Drew in charge of caring for his fish. 3. Everybody Hates Homecoming: Chris is on cloud nine when a cute girl invites him to the Tattaglia Homecoming Dance, but his nerves take a turn when his date's father wants to meet him. Meanwhile, since Chris is busy working with the high school's football team, Drew takes over his hours at Doc's store. 4. Everybody Hates The English Teacher: When Julius and Rochelle decide to raise Mr. Omar's rent, Mr. Omar wants the apartment brought up to code and moves in with the family until the repairs are done. Meanwhile, Chris is assigned a book report but watches the movie version instead, only to discover it's completely different from the book. 5. Everybody Hates My Man: Chris helps out the school's star athlete and his friends with homework so he can hang out with the cool kids in return. GREG tries to tell Chris it's a bad idea, but Chris is too happy until he fails his own quarterly exam. Meanwhile, Julius has a new appreciation for life after he starts a side job picking up dead bodies for Mr. Omar's funeral home. 6. Everybody Hates Doc's: When Doc's obnoxious new girlfriend, Stacy, makes Chris' life a living hell, Chris decides it's about time he split up the happy couple. Meanwhile, Tonya starts wearing a bra to get the attention of the boys in her class. 7. Everybody Hates Snitches: Although he is supposed to watch Drew and Tonya, Chris sneaks out to the movies and witnesses a shootout. When a reward is offered to anyone who saw the crime, Chris tries to decide the best way to collect the money. Meanwhile, Julius takes Rochelle to a musical for their anniversary but accidentally hits one of the cast members, which gets them thrown out of the theater. 8. Everybody Hates Big Bird: Chris is just starting to fit in at his new high school when the dorkiest girl in school, whom everyone calls Big Bird, asks him on a date. Chris agrees to go with her because he doesn't want to hurt her feelings, but after spending time together, he realizes he genuinely likes her. 9. Everybody Hates James: Julius realizes that the key to keeping Rochelle happy is getting advice from the Oprah Winfrey Show. Unfortunately, Rochelle equates Julius' new attitude with an extramarital affair. Chris volunteers for the Big Brothers program, but is surprised to learn who is assigned to him as his little brother. 10. Everybody Hates New Year's Eve: Chris is determined to spend New Year's Eve in Times Square but he can only go if he finds a responsible adult to accompany him. Unfortunately, he can only find two -ex-convicts. Meanwhile, Julius stops a man from jumping off a bridge and becomes a local hero, and Drew and Tonya make a bet to see who can stay up the latest. 11. Everybody Hates Mr. Levine: Rochelle greets life with a new attitude after her birth certificate reveals she is one year younger than she thought she was. A complete stranger helps Chris to safety during a blackout so Chris repays the man by getting him out to meet new friends. And Greg feels he has no identity after realizing schoolmates only know him as Chris and Greg. 12. Everybody Hates Varsity Jackets: Chris and Greg join the wrestling team to impress the ladies. When Rochelle tries to lose weight using a popular weight-loss drink, Julius decides everyone should go on the diet because it's cheaper than buying groceries. 13. Everybody Hates Fakes IDs: Chris and Greg try to find fake IDs or they won't be able to go to the 18 and over Fat Boys concert. Rochelle plans a surprise part for Julius. Drew orders x-ray glasses through the mail, but discovers they don't work and tracks down the company responsible for the faulty product. 14. Everybody Hates PSATs: Chris decides to cram for his PSAT test, but when Rochelle makes the family attend a social event he is left with no time to study and resorts to buying the PSAT answer key. Julius wins a sweepstakes but realizes it's a trap for people who have unpaid parking tickets. 15. Everybody Hates Boxing: Coach Thurman suggests Chris learn to box to defend himself against Caruso. Julius catches the eye of a beautiful woman in the neighborhood who does peep shows from her bedroom window, unaware that it is Drew and his friends who are watching. Meanwhile, Julius thinks Rochelle is having an affair after finding a bill with late night calls to an unknown number. 16. Everybody Hates Lasagna: After reluctantly holding a stash of marijuana for a criminal on the run, Chris has trouble finding an appropriate hiding place that won't get him in trouble. Meanwhile, Rochelle is less than thrilled to learn that Peaches has been enlisted to help her learn the beauty salon's new computer system. 17. Everybody Hates Spring Break: While test-driving the janitor's car, Chris accidentally hits Greg, breaking his leg. With both Greg's parents out of town, Rochelle skips the family's beach vacation so she can take care of him. Meanwhile, Julius has his work cut out for him when he must find a way to entertain Drew and Tonya because rain ruins their trip. 18. Everybody Hates The Car: Chris gets his driver's license and his parents' permission to buy a car, but when the car is stolen and vandalized he realizes owning a car is more than he bargained for. Meanwhile, Rochelle comes a cross Julius' hidden racing form while looking for her secret stash of cigarettes. 19. Everybody Hates Back Talk: Chris decides to take a stand against this mother and refuses to do his household chores but will he end up in hot water? Meanwhile, Mr. Omar thinks he's dying and decides to start saying whatever is on his mind. 20. Everybody Hates Tasha: Chris asks Tasha to be his girlfriend and is surprised when she accepts. But an even bigger surprise comes when he realizes that being a boyfriend means giving up his free time and only doing the things Tasha wants to do. Meanwhile, Rochelle discovers Julius was married to someone before her and that he is not legally divorced. 21. Everybody Hates Bomb Threats: As punishment for Chris' disruption of history class, Chris and his classmates must memorize and recite a famous speech from World War II but Chris decides to call in a bomb threat to the school because he feels he doesn't have time for the assignment. Meanwhile, Rochelle is cursed with a customer's voodoo hex after she refuses to give a refund on her services. 22. Everybody Hates The GED: During the last week of school Chris is informed that one more tardy means he will have to repeat the 10th grade. Despite his best efforts to arrive on time he misses the bus one day and arrives late so he is forced to deliver the bad news to his parents. Drew decides he wants to try out for Amateur Night at the Apollo but must come up with a talent. The video is given in 1.78:1 ratio anamorphic widescreen color. The picture quality is average. It has a relatively clean picture with minor color distortions and noticeable compression artifacts. The audio is given in English 5.1 Dolby digital sound. The track is dialogue driven and audible throughout the presentation. It is closed caption enabled. Director Webisodes: are included for all twenty-two episodes. Intro and Commentary: for the season premiere episode with Ali LeRoi. Deleted Scenes: are included for episodes "Everybody Hates Cake", "Everybody Hates Homecoming", "Everybody Hates My Man", "Everybody Hates PSATs", "Everybody Hates Lasagna", "Everybody Hates Bomb Threats", and "Everybody Hates The GED". Gag Reel (5:19): is a montage of goofs and mess ups caught on tape. Candid With The Cast (27:40): is an interview featurette with director Jerry Levine asking questions of the main cast members. The discussion include retrospectives from season four to earlier seasons, characters, plotlines, guest stars, experiences, etc. Death In The Dining Room (6:00): is a short featurette about filming at the family dining room. Cast and crew members provide input on the set. Give Em Props (6:15): is a behind the scenes look at the props for the show. Property master Brenton Lane leads the tour. As he highlights key props, the scenes they are used in are played. 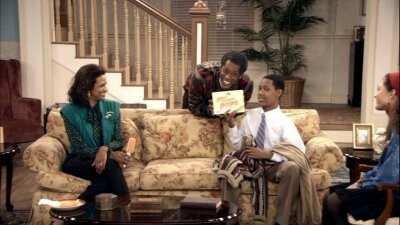 Juste Pour Rire = Just for Laughs (7:27): is a snippet from the season four episode "Everybody Hates Cake". The audio is dubbed with French accents (except Chris Rock's narration). Apparently, it is funny. I didn't get it. The Key to VFX (4:33): reveals the shows heavy reliance on the use of green screens to depict the characters in places that they are not really at. A clip of a segment is shown with the green screen and then the final cut. There is no other information, just clips of pre- and post-production. I was pretty much new to Everybody Hates Chris with this review. From what I had seen, I thought it was funny, but I never really got in to it. As I watched season four, I laughed and enjoyed myself. The storylines are filled with comedy and the perspective of life as narrated by Chris Rock will not fail to entertain. Still, while I enjoyed the season, I did not develop a strong love for it. I think it is good enough to rent and watch, but not to purchase. Unless you have been collecting the series on DVD, rent it (but it is highly recommended to rent).